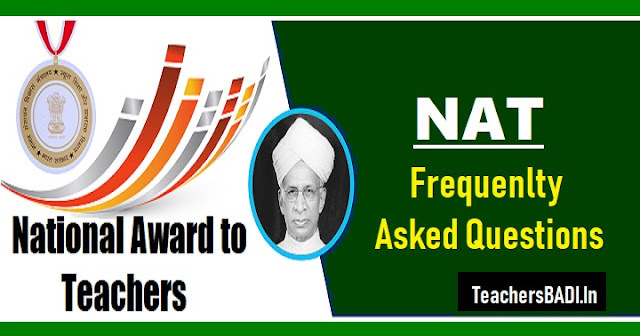 National Award to Teachers 2018, Frequenlty Asked Questions: National Award to Teachers Scheme, NAT Scheme, Guidelines for Selection of teachers for NAT, Procedure for Selection of teachers for NAT, "National Award to Teachers" Scheme. National Award for Teachers is the National Award to Teachers awarded by the President of India on September 5th (Teachers Day) every year to give public recognition to meritorious teachers working in Primary, Middle and Secondary Schools in India. The Selection is made by a State Level Selection Committee/ Central Award Committee presided over by Education Director/ Head of the Organization with a nominee of the Union Government as member. The names of the teachers as recommended by the Committee are forwarded by the State Government/ Organizations in order of merit. The Government of India makes the final selection on the basis of merit. The Award carries a medal, certificate and Rs.25,000/ as award money. The Government from the Award Year 2004 has approved that one family member of the awardee teacher would also be treated as State Guests during theirr stay in Delhi for the function and their expenses would be borne by the Department. 1. What is ‘National Award for Teachers’? This awards program is designed to honour and celebrate the unique contribution of some of the finest teachers in the country who through their commitment have enriched the lives of their students and improved the quality of school education. 2. Who is acknowledging the teachers and how? Instituted in 1958, the National Award to Teachers are given away by the President of India on 5th September (Teacher's Day) every year to give public recognition to meritorious teachers working in primary, middle and secondary schools. The NAT 2018 is being executed under the overall supervision of the Ministry of Human Development (MHRD). 3. When was this award scheme introduced? This award was first instituted in the year 1958 to felicitate remarkable teachers and head masters in their quest to improve the quality of school education and enrich their students’ learning experiences. 4. Who can be nominated? Schools run by State Govt./UTs Administration, schools run by local bodies, schools aided by State Govt. and UT Administration. Also, retired teachers who have served a part of the calendar year (at least for four months i.e. up to 30th April in the year to which National Award relates) may be considered if they fulfil all the other conditions. 5. Who can nominate a teacher? It is a self-nominating award. teachers and Headministers of schools themselves can apply directly by filling the application form online through the web portal before the prescribed cut-off date. 6. Who are not eligible for the awards? Retired teachers who have not served at least a part of the calendar year - at least for four months i.e. up to 30th April in the year to which National Award relates. Teacher/Headmasters who have indulged in tuitions. Contractual Teachers and Shiksha Mitras are also not be eligible. 7. When do nominations close? The nominations close on 30th June 2018. 8. What are the evaluation criteria for the applications? Objective criteria: Under this the teachers will be awarded marks as per clearly given logic against each of the objective criteria. These criteria are given the weightage of 20 out of 100. 9. What are the important timelines of this process? Opening of Web-Portal for inviting applications - 15th June to 30th June, 2018. 10. What happens next after I have nominated myself? After the prescribed deadline for self-nomination, the first level scrutiny of all the applications will be done by District Selection Committee (DSC) headed by the District Education Officer. Upon evaluation of applications and verification of the supporting documents, 3 applications shall be selected (in exceptional circumstances 4 applications may be selected) and sent to the State Selection Committee who shall re-evaluate all the nominations and prepare shortlist of the best candidates, subject to the maximum number allotted to the States/UTs and forward the same to Independent Jury at National level through online portal. Independent Organization Selection Committees (OSCs) may also receive, evaluate and shortlist nominations and submit them to the Independent Jury at National level. 11. What are the different sections of the application that I need to fill to nominate myself? Upon completing all the sections, the applicant can submit their application nominating themselves for the awards. 12. How do I register myself? The applicant has to go on to the web-portal http://www.nationalawardtoteachers.com/index.html to register themselves by clicking on the apply now key. 13. Where can I obtain a nomination form? This is an online self-nomination process. The applicant has to register themselves on a web portal http://www.nationalawardtoteachers.com/index.html to apply for the award. 14. Should the application be completed at the same time as registration? No. The application can be completed over-time. The applicant can save the information as when he/she is uploading them. the next time, the applicant needs to simply login using the username/mobile number and password. 15. I’m nominating online. How do I include supporting documentation? The supporting documents should be uploaded in the PDF, JPEG (pictures) format. It is also mandatory to provide a URL link to the documents/ videos. 16. I forgot my username. How do I login? One can use their mobile number to login into their application if he/she has forgotten their username. 17. Can I review my application? Yes, the applicant can review their application after the final submission. If required, the applicant can further edit the information provided by them. 18. Is there a help line for the applicants? Yes, there is a helpline number provided to the applicants in the web portal and mobile app. 19. I do not have an Aadhar Number. Will that be a problem? Yes. An applicant should have a Aadhar number to apply for the awards. 20. Can I edit my personal information after I already filled it? Yes, the applicant can edit the information as many times as desired during the application process. However, once the final application is submitted, they cannot edit any information provided by them. 21. Can I alter any information/ responses after the final submission is made? No. The applicant cannot alter any information after the final submission is made. 22. I forgot my Password. What can I do? Yes. The applicant can retrieve their password by providing their User ID/ Mobile number. 23. I have a problem uploading photographs/ supporting documents? Please go to an area with better internet connectivity. Please check that the resolution of the image is less than or equal to 1 MB. Auto compression features is available in the app. 24. In which format, should the supporting documents be uploaded on a mobile app/Web portal? The supporting documents should be uploaded in the PDF, JPEG (pictures) format. It is also mandatory to provide a URL link to the document. 25. I teach in a CBSE School. Which institution category do I select when registering myself? 26. I teach in a state government school. Which institution category do I select when registering myself? When applying for the awards at http://www.nationalawardtoteachers.com/Short_Signup.html, please note that the application has to choose the organization they are currently engaged with. If a teacher/ Head Minister is from a state government school, he/she needs to choose the option “Govt. and Aided schools under States/ UTs”. If a teacher/ Head Minister is from a CBSE school, he/she needs to choose the option “Central Organizations”.